There’s just something about the anime series Bleach that triggers nostalgia for my time as an awkward, nerdy high schooler in a way nothing else does. Play me just a little bit of the soundtrack and I’ll be right back to my 17-year-old self, whiling away countless hours watching it with my brother on our parents’ desktop computer. Engaging with this series again always feels like opening a late-2000s time capsule and rediscovering all the reasons my love for anime began. As I’ve written before, Bleach is not without its controversy, or its significant faults, but it’ll always hold a special place in my heart despite all of that. 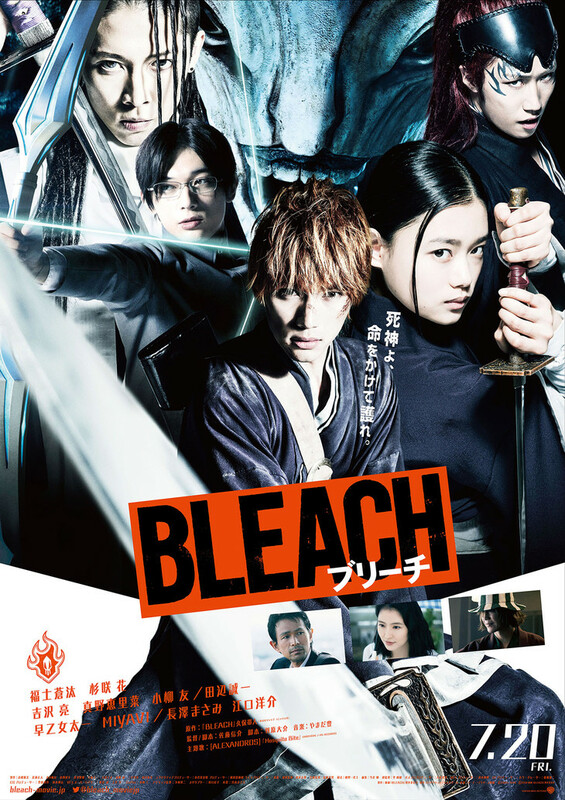 So when I heard that there was going to be a live-action Bleach film coming to Netflix this month, I decided I had to watch it—I just had to know, cautionary tales about live-action anime films be damned. As most anime fans will tell you, the world of live-action anime is fraught, to say the least. A lot of the big-ticket series have gotten live-action versions over the years, including Rurouni Kenshin, Fullmetal Alchemist, Death Note, and Dragon Ball, to name a few of the most famous (and infamous). The quality has been decidedly better in some cases than in others, to be sure, but one thing that’s roundly agreed upon by most fans is that live-action anime movies tend to be, in a word, crappy. There are certainly exceptions to this rule, but by and large, these movies have a pretty awful reputation. Which is why, up until now, I’d avoided watching them. Some of them have the potential to be the “so bad it’s good” sort of watch; I enjoy those as much as the next person, but it’s something I have to be in the right mood for, and I’m rarely ready to risk my free time by watching something that’s got a higher-than-average chance of being terrible. But when I found out about Bleach, I knew the time to take the plunge had come. When all was said and done, I had a lot of thoughts about this movie, both positive and negative, but on the whole, watching it was an enjoyable experience—certainly more enjoyable than I expected. Adaptation-wise, this film sticks pretty darn close to the source material; the plot follows the build-up of the anime’s first main story arc to a tee. In it, our hero, Ichigo Kurosaki, is living a fairly normal life as a typical high schooler—despite the fact that he can see ghosts. He takes this strange power pretty much in stride until, one day, he encounters Rukia Kuchiki, a mysterious soul-reaper who is drawn to him because of his strong spiritual power. She reveals that she is hunting a Hollow, a creature that manifests from the soul of a human who died with a grudge. In an altercation with the Hollow, Rukia becomes too injured to fight and transfers some of her power to Ichigo so he can finish the job. It’s not until after the fight is over that Rukia realizes she went too far and accidentally transferred all of her powers to Ichigo, thereby stranding herself in the human world. To get back home, Rukia has to train Ichigo to harness his new powers well enough to defeat the Hollow she originally came to his world to hunt: the Grand Fisher. Ichigo is ambivalent about this at first, until he finds out that this Grand Fisher creature isn’t just some random monster—it’s the same monster that hurt his family when he was a little kid. Now, Ichigo’s task of hunting down the creature isn’t just a way to help out his new friend. It’s personal. Unsurprisingly, the most notable feature of this movie, at least to me, was the nostalgia factor. There were so many moments when I was thinking (or sometimes saying to the screen), “Oh man, I forgot about that part!” It’s been long enough since I’ve last seen the first bit of the original anime series that it was fun to be reintroduced to some of the different story elements and set pieces, and even more fun to see how they were translated to a live-action context. Beyond this, there were a lot of things that stood out to me. The special effects were unremarkable for the most part and even clunky or absurd-looking at times, but even so, some aspects were pretty cool-looking. The Hollows, for instance, managed to be legitimately scary despite looking kind of like giant tiki monsters. The fight sequences were another good feature, excellently choreographed and easy to follow, which is something I find to be somewhat of a rarity in films with lots of action. The characters were overall pretty great as well; aside from their costumes, a lot of them looked quite a bit different than their animated counterparts, but almost all of them embodied the personas of the original characters perfectly. Beyond this, there were lots of little touches that worked just as well in live action as in the anime—for example, Rukia using her special soul-reaper glove to punch Ichigo’s shinigami spirit-self out of his body was as funny as ever, as was her penchant for explaining supernatural concepts by way of cutesy drawings of bunnies. Despite the high points of the film, though, there were a few things that, in my opinion, didn’t translate well to live action. The most obvious and predictable of these was the appearance of some of the characters. As with lots of anime series, many of the original characters in Bleach have pretty outlandish appearances in terms of their hairstyles and clothing, and the movie stuck very closely to the original in this regard. Sometimes it looked good, but in several cases, things that looked cool in the anime were noticeably weird on a real person. The typical over-the-top anime-style reactions tended not to work particularly well, either—exaggerated emotions and facial expressions are a hallmark of anime, but when they’re recreated by real people, it tends to just look like they’re aggressively overacting. I’m guessing this is pretty common for live-action anime films, though I don’t have the frame of reference to say for sure; regardless, it was noticeable, and generally not in a good way. Beyond these more superficial elements, the other main flaw of the film was the pacing. It started out pretty well, but as the movie hit the halfway point, things slowed down a lot, and I found myself getting a little bored with it. One might say this is a good analog for the original series, I suppose, but it made the movie feel a little tedious after a while. Around the point when things were slowing down, I had the realization that if they were sticking this closely to the plot, there was still a ton of story left in terms of the original anime. Because of this, in order to for the film to have a cohesive story that could stand on its own two feet, it would have to either end with a major cliffhanger or wrap up in a neat, non-canonical way that would leave things feeling contrived and—dare I say it?—hollow. It ended up being the latter, much to my chagrin (but not surprise). Things did at least conclude in a way that made decent sense, but the way the production changed things to make a reasonable ending for a film left the plot feeling really thin overall. I’d be willing to bet that if someone who had no prior knowledge of the series were to watch the film, they’d feel like it just didn’t have all that much to it, and that there’s a lot missing (or a lot of avenues the story could have gone down but didn’t), even if they couldn’t put their finger on what the missing elements were. All things considered, I’m not sorry I watched this movie, and there were many things I enjoyed about it. I have a feeling it’s relatively good for an anime film of this type—however, as a film in its own right, it’s only so-so, in my opinion. A non–Bleach fan might still get some enjoyment from the movie, but they’re more likely to find themselves bored or even confused by the story; because of that, I’d recommend giving it a pass if you’ve yet to watch the anime or read the manga. On the other hand, I would recommend it to anyone who’s a fan of Bleach already, both those who have kept up with the series faithfully and those who, like me, have a more casual interest in the series. No matter what kind of Bleach fan you are, there’s likely to be something about the film that interests you. (Come for the nostalgia; stay for the sweet, sweet fight sequences!) And the prevailing reaction among other anime fans who’ve watched this movie seems to be pleasant surprise at how good the film was in comparison to other adaptations out there. That, to me, makes the movie worth watching. Bleach is available for streaming on Netflix as of September 14, 2018.